In 1838, biblical scholar Edward Robinson discovered a tunnel that connected the Gihon Spring, outside of Jerusalem's walls to the Siloam Pool within its walls. 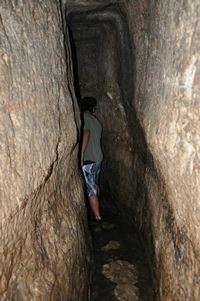 The tunnel was cut out through bedrock, S - shaped with a length of 1,750 feet (1/3 of a mile), and with a slope of 0.6% which brought fresh water to inhabitants within the walls of Jerusalem. Jerusalem was vulnerable to any attacking force who could block and control its water supply. In preparation for the impending siege by Sennacherib and the Assyrians (2 Kings 18:1-37; 19:1-37), King Hezekiah (reign approximately 725 B.C. – 696 B.C.) ordered for the construction of the aqueduct which was chiseled out by 701 B.C. Unbeknownst to Edward Robinson and discovered later in 1880 inside Hezekiah's Tunnel, the aqueduct's completion was commemorated by its builders with an inscription called the Siloam Inscription. Now housed at the Istanbul Archeology Museum, the inscription is comprised of six lines and is noteworthy as one of the oldest examples of Hebrew written in the Paleo-Hebrew alphabet. The plaster used for the Siloam Inscription and the organic matter contained within it was dated to the 8th century B.C. which is coincident with the time of Hezekiah. While it is not completely legible, the Siloam Inscription describes how the tunnel was evacuated by two teams starting at opposite ends. Led by sounds generated by hammering from above, stonecutters were guided to each other and met at the center all the while mindful of the distance to the top of the rock. Despite having several directional errors and misalignment of the tunnel center, the stonecutters succeeded in completing the tunnel before the siege. The biblical record of Hezekiah's Tunnel is remarkably accurate. Not only does the tunnel exist and constructed at the appropriate time, but its location and flow direction is also correct: west of the City of David and flows from east to west (2 Chron 32:30). "As to Hezekiah, the Jew, he did not submit to my yoke, I laid siege to 46 of his strong cities, walled forts and to the countless small villages in their vicinity, and conquered (them) by means of well-stamped (earth) ramps, and battering-rams brought (thus) near (to the walls) (combined with) the attack by foot soldiers, (using) mines, breeches as well as sapper work. I drove out (of them) 200, 150 people, young and old, male and female, horses, mules, donkeys, camels, big and small cattle beyond counting, and considered (them) booty. Himself I made a prisoner in Jerusalem, his royal residence, like a bird in a cage. I surrounded him with earthwork in order to molest those who were leaving his city's gate". 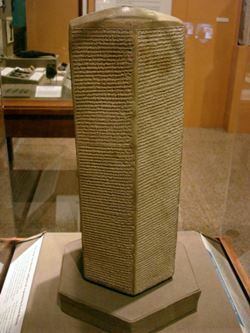 The Bible records Sennacherib entering Judah (2 Chron 32:1), besieging Lachish (2 Chron 32:9) and after its conquest, proceeding to attack Jerusalem (2 Kings 18:13 - 19:37; Isa 36:1-22). 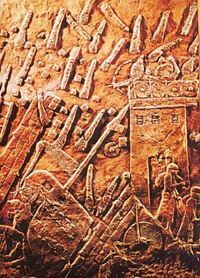 An impressive wall relief among the ruins of Nineveh portrays the conquest of Sennacherib. Pictures of the sloping siege ramps against the city of Lachish, Assyrian warriors and Jewish captive celebrate the victory over Lachish. However there is not one image that celebrates the conquest of Jerusalem. The Bible records Hezekiah as seeking the help of the prophet Isaiah (Isa 37:1-13) and praying to God for deliverance (Isa 37:14-20). God responds though the prophet Isaiah (Isa 37:21-35), Jerusalem does not fall, and the Assyrians are destroyed (2 Chron 32:20-22; Isa 37:36-37). Assyrian records indicate that after Sennacherib returned home, he was murdered by his sons. The Bible records this as well in Isaiah 37:37-38. 1. Rogerson J, Davies PR, "Was the Siloam Tunnel Built by Hezekiah?" in Biblical Archeologist, vol. 59, 1996. 2. Eshel E, "Defusing Pseudo-Scholarship: Some Paleographic Success Stories," in Biblical Archeology Review, Mar/Apr 1997. 3. Hurvitz A, "Defusing Pseudo-Scholarship: Philology Recapitulates Paleography," in Biblical Archeology Review, Mar/Apr 1997. 4. Shanks H,. "The Siloam Pool," in Biblical Archeology Review, Sept/Oct 2005.